Green t-shirt, Nike. 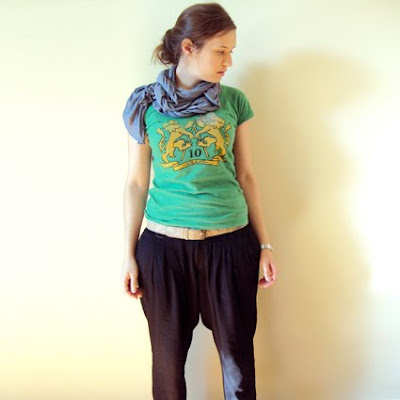 Black harem pants, Pull&Bear. Grey scarf, H&M. Red flats, Maloles. Belt, Zara. Bag, Mango. 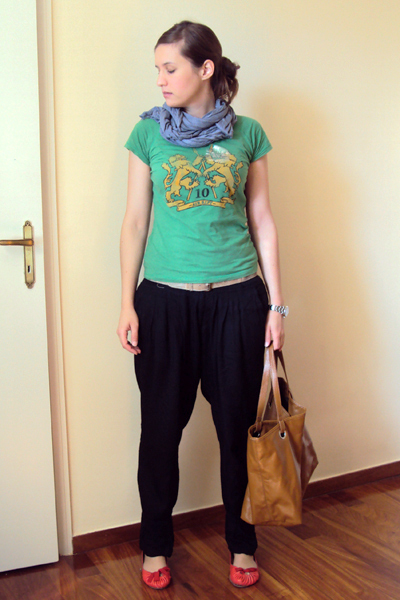 Casual, comfy, just-threw-something-on-to-pop-to-the-kiosk outfit, perfect for days like this one. I got this t-shirt four years ago, in Niketown, NY. It belongs to a more casual era of my life, but I still wear it occasionally. You see, I get very emotionally attached to every piece of clothing I buy and I can't bring myself to throw away anything. And even when I give away stuff of mine that I don't wear any more, I do it knowing the receiver will love and appreciate them. Oh, and yes. I'm wearing love-to-hate-them harem pants. i totally get your point. 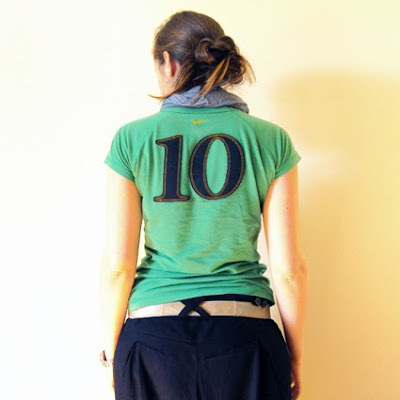 In this outfit, i find very interesting your choice of matching these colors.. the t-shirt is wonderful, indeed. you look absolutely adorable. and i adore your harem pants i want some so badly. i found you some green shoes. if you like heels that is. haha, I already have one pair of pumps and one pair of ballerina flats in kermit-the-frog green, but do send over that link, I love window shopping! impossible...Anyway i love your look today -twitter- girl!! it's nice to love your stuff!you have bn a lot 2gether..
:) just google Nine West Women's Elkie Heeled Sandal Green, they are over at Javari ...i think they would look so cute with that skirt you are wearing in the lucky article..
to xalaro casual einai to agaphmeno mou...dn mporw namai olh mera panw se takounia k me stena rouxa..